Crazy about carrots? 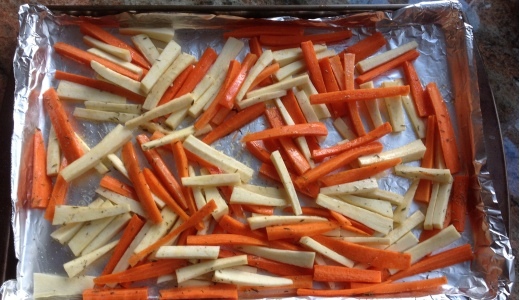 Try this roasted carrots and parsnips dish. The hardest part is the prep and that’s not exactly taxing. If you have left-overs, you can turn them into a tasty soup with the simple addition of vegetable or chicken broth. I’m a big fan of carrots, either raw or roasted. I like all vegetables that are naturally sweet. But I don’t use parsnips very often, probably because they’re less common and I didn’t grow up eating them. Like carrots, parsnips are a root vegetable, but they have a milder flavor. They’re high in dietary fiber, vitamin C and B-complex vitamins. The carrots offer an excellent source of beta carotene and vitamin A. These root vegetables are related and their tastes complement each other in this dish. Preheat your oven to 400 degrees. Wash and peel the vegetables and julienne them (this is the most time-consuming part). They don’t have to be perfect, just close enough to the same size so that they’ll cook evenly. If you have a nifty little tool that does this for you, then the whole process should be a breeze. Line your roasting pan with aluminum foil. It’ll make clean-up so much easier. Spread the vegetables into the roasting pan and drizzle with olive oil. Sprinkle with thyme, salt and pepper. Mix so that the seasonings and the olive oil are well distributed. Roast for 20 minutes, then stir. Return to the oven and roast for another 15-20 minutes. That’s all there is to it. This is an easy recipe that tastes great, with the added benefit of being good for you. If you do have left-overs, it’s easy to turn them into soup. 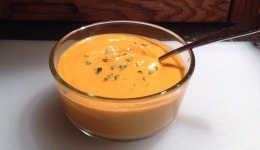 Put the leftovers into a high-speed blender and add vegetable or chicken stock. Puree until smooth and add broth until you reach the consistency you desire.